Solace series in-floor dialysis scales by Detecto are flush-mounted platform scales that feature stainless steel decks and include a pit frame, trim ring, and interface cable to the included multi-color, touchscreen LCD indicator and printer. The flush surface eliminates tripping hazards and hallway accessibility issues. The Solace series is available with or without a handrail and all models include a recessed-mount indicator and ticket printer combination. 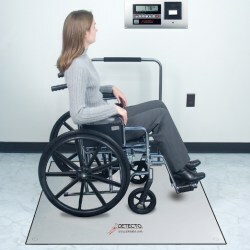 These in-floor scales with high 1,000-lb x 0.2-lb/450-kg x 0.1-kg capacity easily accommodate patients with walkers, canes, wheelchairs, dialysis chairs, and the 6 x 4 ft. size even accommodates stretchers. The Solace series, available from Central Carolina Scale, comes in 8 standard models to choose from with 3 x 3 ft, 4 x 3 ft, 4 x 4 ft, and 6 x 4 ft stainless steel platform sizes (custom sizes/configurations available).